He was born on the 24th of February, 1962 in one of the most beautiful place in Garabagh – Khojali region. Ingilab finished secondary school in 1979. He was called for military service in 1981 and served in the Internal Army. During his military service, he finished the school of officers in Kharkov city. He returned to his native Khojali in 1984 and started working as a tractor driver in a state farm. The situation in Garabagh region was becoming more and more intense starting from 1988. Armenian bandits were all the time trying to force ethnic Azeris to leave their lands and in order to achieve their hideous goal they were ready to sell their souls to the devil himself which they already did. The brave sons and youth of Khojali region were all the time on guard. Ingilab was among them. He started working in Khojali Police Department in 1990. Meanwhile the enemy was continuously attacking. Armenians were bombarding the city every day. During those explosions, the houses were destroyed and thousands of innocent families were killed. The situation was becoming worse and worse day by day. Khojali was under the siege from everywhere. It was necessary to evacuate the women, children and the old as soon as possible. Ingilab was helping the civilians to be evacuated. The night of February 26, 1992… armenian bandits together with russian platoon # 366 committed yet unseen crimes and massacre towards innocent people of Khojali. Ingilab Along with his friends managed to take the rest of the people that were still alive to a safer place. He took his family to Oghuz region and returned back to the combat zone again. He was still serving in Aghdam region Police Department. The battalion where Ingilab was serving, was there to protect Dashhbashi heights. Armenian armed units were trying to capture those heights but all the time, they had to retreat with heavy losses. The enemy attacked Dashbbashi heights again with a large force on the 12th of June, 1992. The courageous fighters once again protected heights with honor and they did not only prevent the enemy from invading the heights but also destroyed 6 posts of the enemy. In this unequal fight, Ingilab gained the victory with his own blood. Even though, his battle friends were trying very hard to take his body from the battle field, they were not able to do so. 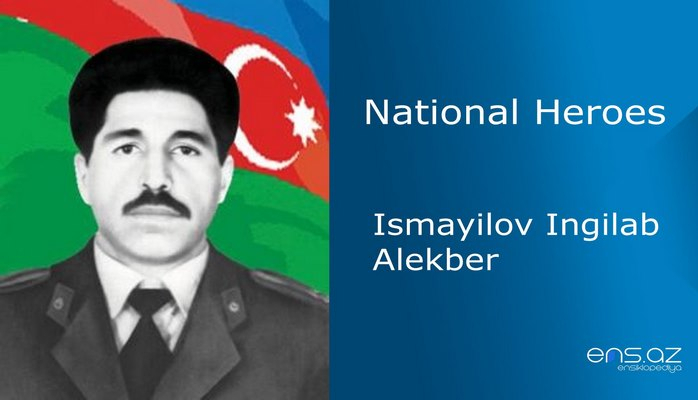 IsmayilovIngilabAlekber was posthumously awarded the title of the “National Hero of Azerbaijan” by the decree # 264 of the president of the Republic of Azerbaijan on the 8th of October, 1992. One of the streets in Khatai district of Baku city is named after the hero and there is also a memorial plaque of him in the same street.